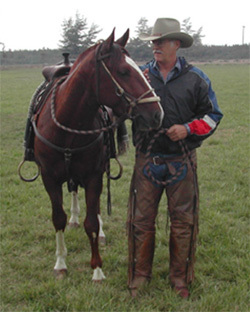 My mission is to do everything within my power to fortify and promote the Chilean Horse breed as a unique stock horse that has the oldest and purest registry in all the Americas. My undertaking will be to better inform the world about this little known breed so that the visionary founders receive the deserved recognition for accumulating so many distinctive qualities in an equine package that combines a hardy, energetic, willing and athletic demeanor. That the homogeneous and prepotent genealogy; the clearly defined and consistent type; and the deeply inbred aptitudes and instincts for stock horse performance, have not been altered by the whims of fads or undue pressures of commercialization, is a credit to the Chilean forefathers of this breed. It is my task to partake in the didactic role of informing all interested parties of the particular history, culture and geography that gave rise to this supreme cowhorse. As I carry out my duties I hope to put the contemporary Chilean Horse in the limelight it deserves so that its potential in international stock horse competitions can be envisioned by horse enthusiasts from around the world.